Overstuffed subs and delicious pizza in your neighborhood! 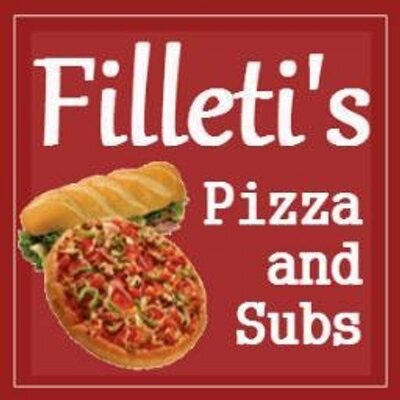 Serving Dundalk for over 25 years, Filleti's Pizza & Subs is a family-owned restaurant that offers a delicious variety of pizzas, submarine sandwiches, chicken wings, salads and dinner entrees sure to please everyone. Delicious house specialties are prepared with the highest quality ingredients and include the ever-popular traditional Filleti's cheesesteak sub, Italian cheesesteak sub or chicken cheesesteak sub. You can even make your own cheesesteak creation with lots of customization options. Add to this, Filleti's offers well over twenty-five different sub sandwiches. Filleti's Italian menu selections include pasta dinners, veal parmesan, meatballs, calzones, stromboli and of course, pizza in three sizes with your choice of toppings. Dinner menu choices feature hot beef and hot turkey platters, and several seafood entrees including haddock, flounder and fried shrimp. Whether you dine-in or order online for delivery to your home or office, you can count on Filleti's Pizza & Subs for friendly service and affordable meals for lunch or dinner. Filleti's Pizza & Subs restaurant is located in Dundalk on Merritt Blvd. (MD 157) at German Hill Road in the Merritt Manor Shopping Center. Nearby: Gold's Gym, Sherwin Williams, Dollar General, Dundalk Lanes. Online ordering available for pickup or delivery. © 2019 Filleti's Pizza and Subs. All rights reserved.